Down to my last few weeks in Canada and am now trying to clear a bit of my remaining pantry. Still have a little of the spent grains from the previous spent grain bake which I decided to incorporate in last week's bake. And why not throw in a little beer to make it a beer bread something which I wanted to try for a long time. 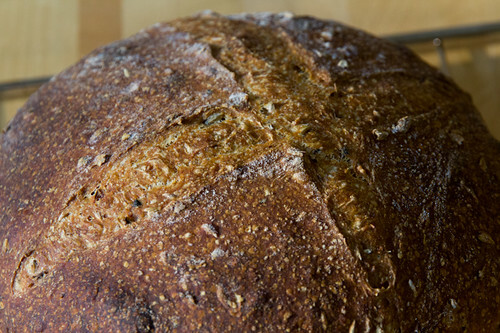 Recipe was adapted from Dan Lepard's barm bread. Heat up Ale until 70C. Whisk in Flour. Let it cool and add the starter. Leave to ferment for about 12 hours. (While researching on the recipe, I noted that there is a wide variance to the fermentation time from 8-36 hours). I left mine for 20 hours but I felt it could go longer. I used half the batch for my 1st try but it resulted in a dense bread with little fermentation which I tossed out. To remedy the situation I added some extra sourdough starter for this batch. Mix and ferment for 8 hours. Mix all together and ferment for 7 hours with 2 stretch and folds in between. Preshape and rest for 30 minutes. Shape and proof for 2.5 hours and bake at 230C for 45 minutes. I must say that this bread really taste great and was well worth the lengthy procedure. Can you really taste the beer? Not really but the barm helps the loaf retain quite a bit of moisture, like a water roux commonly used in chinese styled bread. I would like to think it imparts lots of flavours to the bread as well! 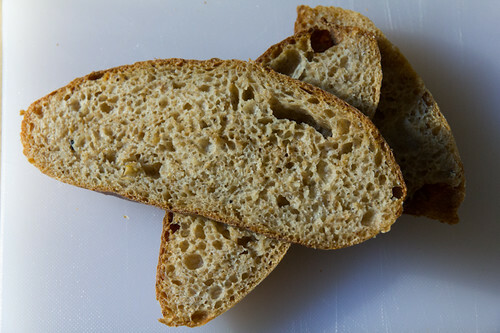 And the crumb was beautiful from the long fermentation time and high hydration used. It felt like a 75% dough but taking into account that wholewheat was used and the inclusion of the barm, I guess it is about 82%. Not so easy to handle and shape but turned out great. 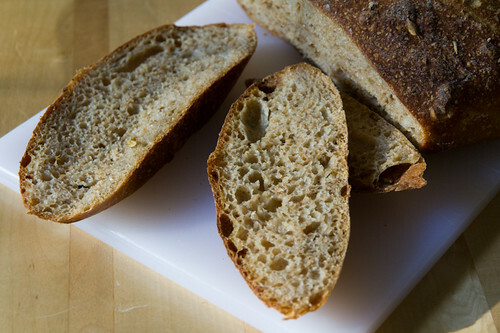 The spent greats lend a nice texture to the bread too providing a bit of bite and something to chew on. Just in time for lunch. 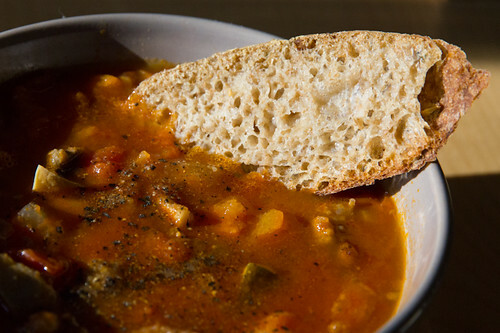 That looks great (as does the soup). Spent grains are the leftovers after the initial stage of brewing a beer where you heat up the grains to a certain temperature to maximize enzyme activity. Much of the sugar, proteins and nutrients have seeped into the water which will then be used for brewing the beer. The remaining grains are normally disposed off or used as animal feed though it can be used for making bread too. Hope that helps! Nice job. Those look great and must taste even better. Perfect with soup or a nice hearty sandwich. Thanks Ian. I had it both ways, soup on the first day and sandwich on the next! Thanks Phyllis. I would imagine cooked grains would be a good substitute. All the best! wow this sounds and looks fantastic! 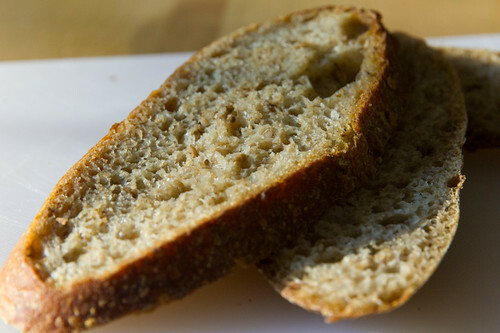 I'm definitely trying this but with 100% wholewheat and maybe some cooked farro. Is there some reason you've prepared around 300g of barm and then used only half of it? Also have you left it ferment for 12h or 20h? Do you think that without heating up the ale you can ferment the barm longer then you did?